January at the Beach (Posterized Photo), a photo by randubnick on Flickr. Yesterday we had temperatures in the fifties, here north of Boston. Today began with warm winds and quick rains followed by sun and cooler air moving in. 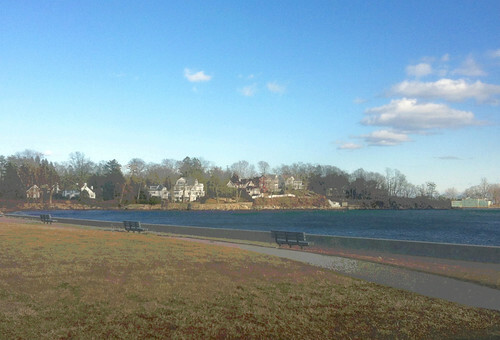 Even though the temperatures were dropping, it was such a beautiful day that we decided to take walk at Dane Street Beach (Beverly, MA). We were overly optimistic. By the time we got there, it was down to forty degrees, maybe less, but with a strong wind that made it feel much colder. So our walk was very short! But the view was great, so I took a few quick pictures. Tonight I edited this one in iPhoto and applied selective posterizing effect with Painter 12. Fabric Flowers and Vase, a photo by randubnick on Flickr. This afternoon I worked on this project, a still life made up pieces of cloth pasted to a cloth backing with iron-on adhesive. My focus today was adding stems and leaves, trying to make sure that none of the flowers seemed to float off into space. I tried to curb my enthusiasm for fear of overdoing it. I may find things that I want to fix or revise, but I think this is done, apart from finishing the edges of the black cloth backing. 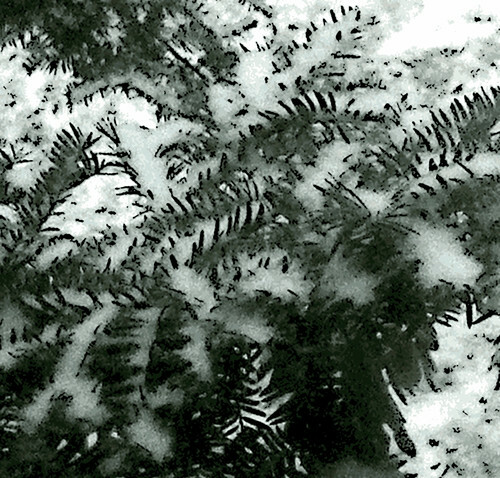 New Snow on Evergreen Branch (Digital Woodcut), a photo by randubnick on Flickr. Tonight I used Painter 12 to apply a woodcut effect to the photo that I posted here yesterday. The woodcut effect emphasizes lines and textures, and I thought that would work well with this image. New Snow on Evergreen Branch, a photo by randubnick on Flickr. It started snowing mid-afternoon. I liked the way these soft new snowflakes looked among the evergreen needles, so I took a picture. Tonight I used iPhoto to do some basic editing and then cropped the image to get this composition. Fabric Flowers and Vase (Day 12), a photo by randubnick on Flickr. This is the appliqué still life I have been working on, using iron-on adhesive to attach the pieces of fabric to the black cloth. Today I added some leaves and stems, trying to make sure the placement makes sense and looks good. 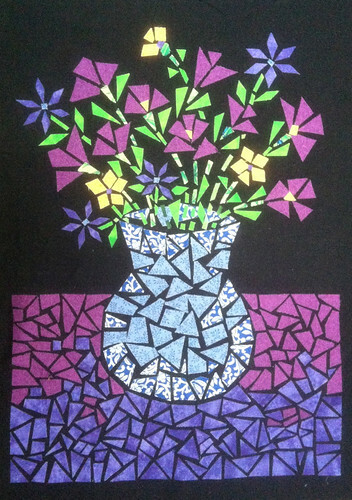 I also added purple centers to the yellow flowers. I am going to leave the top half of the background black, so at this point, there is just a little bit more to do. Fabric Flowers and Vase (Day 11), a photo by randubnick on Flickr. This afternoon, I worked for a while on this project, a still-life done in fabric, like a collage or mosaic with iron-on adhesive. I worked on added some stems and leaves, trying to match leaf shape to petal shape, and trying to make the placement believable. The closer a project is to being finished, the more cautious I become. So now I am working slowly and deliberately, and when I feel myself rushing, pasting something down so I can get finished, then I know it is time to stop working for the day. Near Durham New Hampshire, a photo by randubnick on Flickr. This morning, I tagged along on a quick trip to Durham, New Hampshire. This was an unexpected errand, just a drive up and back. I agreed to go, lured by the prospect of a stop at the outlet stores in Kittery, Maine, on the way home. 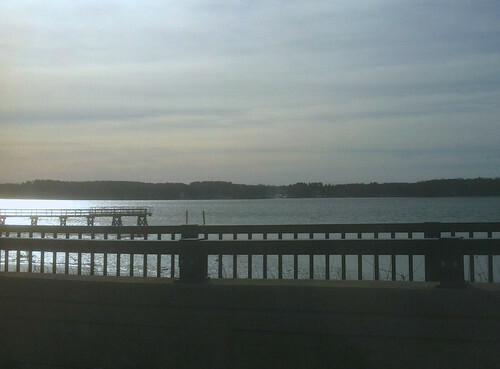 But really, the trip itself is reward enough, with beautiful lakes along the road to Durham. I took a few pictures this morning. Tonight I cropped this image from the best one, and used iPhoto to do some basic editing. Fabric Flowers and Vase (Day 10), a photo by randubnick on Flickr. I took a break this afternoon and did some more work on my fabric still life. It was very cold today, a good day to work on this project because I am using the iron and iron-on fabric adhesive to create this appliqué. Today I added some leaves, working slowly and trying to figure out where the leaves should go. I started to late in the afternoon so was not able to photograph this in natural light, which is why the colors look different. 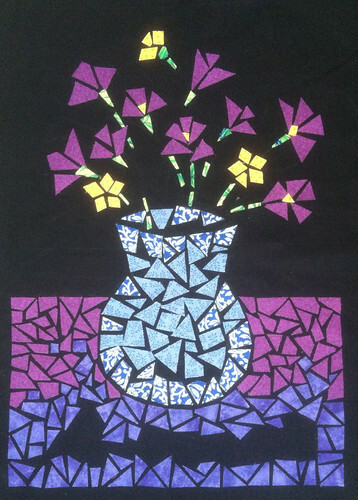 Fabric Flowers and Vase (Day 9), a photo by randubnick on Flickr. Today I did some more work on this project, a still life created with pieces of fabric (attached with iron-on adhesive backing). I started this project in a fabric arts class several years ago but left it unfinished until I resumed work on it this month. Today I finally finished filling in the purple area at the bottom of the image. 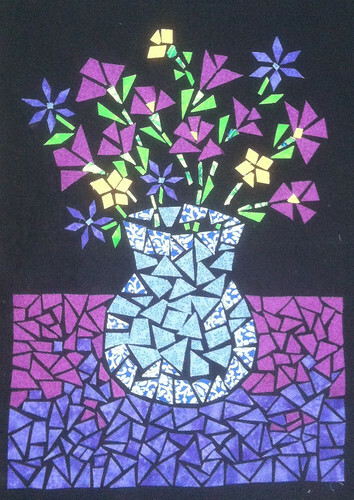 I also added some purple and blue flowers, trying to make sure that the result will be a balanced composition. Now that I have the flowers in place, I can go back to work on the stems and leaves. 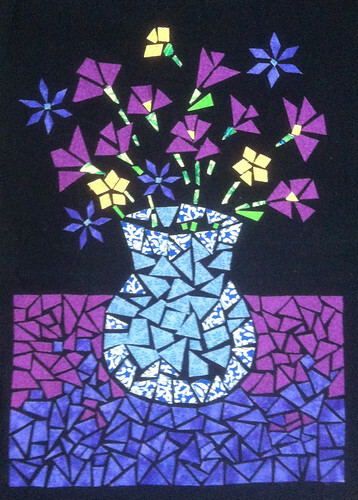 Fabric Flowers and Vase (Day 8), a photo by randubnick on Flickr. This afternoon I did a little more work on this project, a still life in pieces of fabric, attached with iron-on adhesive. I started this project several years ago in a fabric arts class. Even though I liked it, I never got around to finishing it, but came across it again some weeks ago, and have been working on it steadily. Today I continued filling in the purple area at the bottom of the image. I also worked a little bit on stems and leaves. Snowing on Hemenway Ave, Boston (Digital Woodcut), a photo by randubnick on Flickr. Tonight's adventure was a drive into Boston for dinner with a friend who is in town for a few days. It started to snow and I had forgotten how beautiful Boston can look when it snows. I was in the back seat for most of the evening, so I took out my iPhone and tried to get some pictures. This image began with one of those photos, taken at the corner of Hemenway Ave and Westland (in the Back Bay). It was snowing, and starting to stick. Later, when I was back home, I used iPhoto to do basic editing (straighten, crop, adjust contrast) and then used Painter 12 to apply the woodcut effect. Fabric Flowers and Vase (Day 7), a photo by randubnick on Flickr. 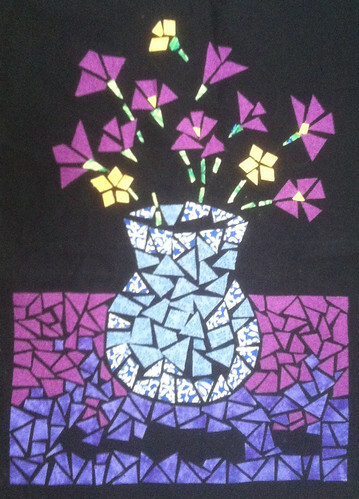 Today I kept going on this project, a still-life made out of appliquéd fabric (attached with iron-on adhesive). I continued to add to the purple area at the bottom of the image, and worked in a few pieces of the dark pink as well. I also added a few pieces of cloth to the vase. I realized that I am going to have a bit of a challenge when it comes to adding the stems, but I will cross that bridge when I fall through it. January Tree Tops (Digital Woodcut), a photo by randubnick on Flickr. Yesterday's post was a photo of snow-covered tree tops, taken on January 16, 2013, one of the few really snowy days we have had so far. Tonight I made this "digital woodcut" from the same photo by applying Painter 12's woodcut effect. To make this work, I lighted the image and then fiddled with the woodcut controls to get the black line where I wanted it to be. January Tree Tops, a photo by randubnick on Flickr. Here's another photo that I took earlier this week (January 16 when we had snow). I love the tracery of the trees, so I took some pictures. Tonight I cropped this image out of the original photo. I am wondering how it would look with a woodcut effect. Fabric Flowers and Vase (Day 6), a photo by randubnick on Flickr. I took a break this afternoon to work on this project for a little while. 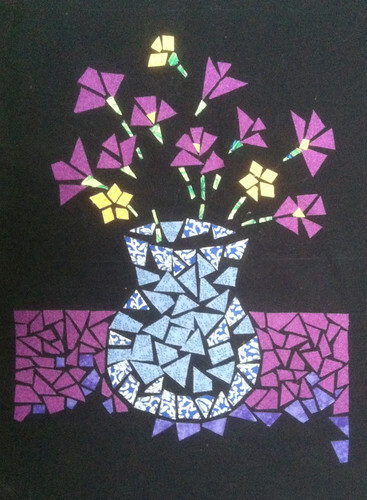 This little still life is made of pieces of fabric, attached to the backing with iron-on adhesive. I started this project in a fabric arts class several years ago, but hadn't gotten around to finishing it. It seemed like a good project for January, with that nice warm iron. Today I continued to work on filling in the purple area at the bottom of the image. Snow in the Morning, a photo by randubnick on Flickr. I was surprised to see snow this morning. I had been only vaguely aware of snow in the forecast, but maybe just an inch. But this morning, there were already several inches on the ground and it was still snowing. So then I checked the weather app on my phone, and saw that the temperature would soon be on the way up, above freezing. 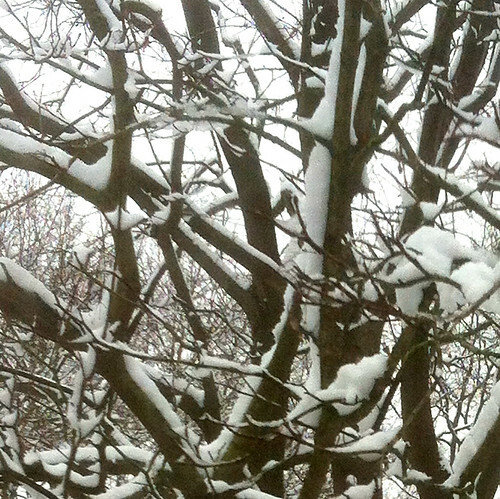 That meant less inconvenience from the weather, but it also meant that the snow wouldn't stay on the branches for long, so I took some photos with my iPhone. 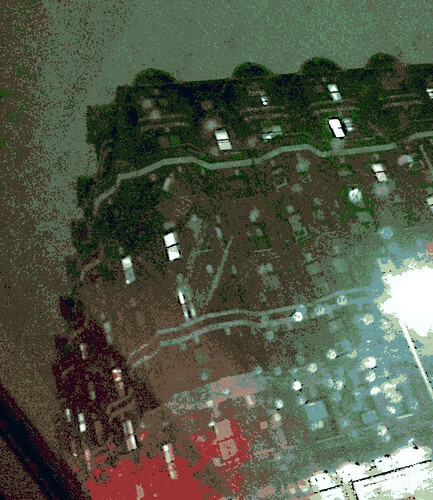 Tonight I edited this image in iPhoto and cropped it to get this composition. Fabric Flowers and Vase (Day 5), a photo by randubnick on Flickr. This afternoon, I worked on this project for a bit. 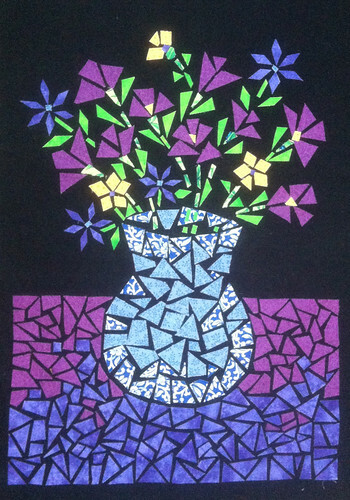 I started this fabric collage or mosaic back in 2008 when I signed up for a fabric arts class at Red Brick Studio. We learned a lot of different processes, but this was one of my favorites. I originally put it aside because I needed more adhesive backing, and more material. But once I got the supplies, I just never made time to get back to this project. I came across it recently when I was straightening out my studio, so I have been working on it all week. The pieces of fabric are attached with iron-on adhesive backing, so it is really very easy. I have been working on the area near the bottom of the image (purple pieces). Today I decided to establish the borders, so that is what I worked on. I also added a few pieces of blue fabric to the vase. Fabric Flowers and Vase (Day 4), a photo by randubnick on Flickr. Today I took a break to work on this project for a while. 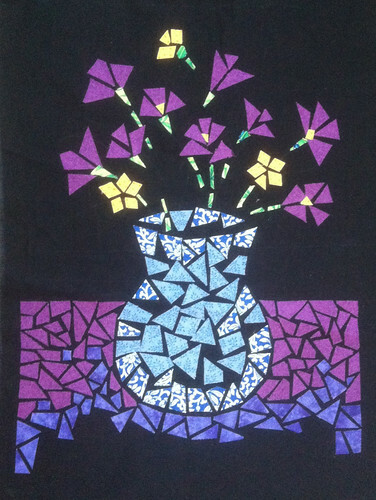 This collage or mosaic still life is made of fabric. No sewing involved, just iron-on adhesive backing. Although this is "Day 4", I actually started this project during the summer of 2008 when I took a fabric arts class at Red Brick Studios. Today I continued to work on the purple area at the bottom part of the image. Patterns in Blue (Revised), a photo by randubnick on Flickr. Patterns in Blue, a photo by randubnick on Flickr. It was hard to find time to make art today, but tonight I made this image using the Brushes app on my iPhone. Fabric Flowers and Vase (Day 3), a photo by randubnick on Flickr. Today I went back to a project that I started back in the summer of 2008 while I was taking a fabric arts class at Red Brick Studios. 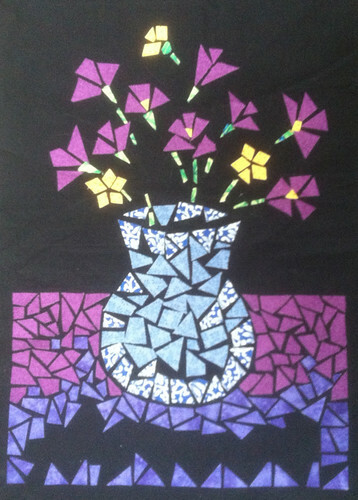 I learned a lot of new techniques in the class, but this was one of my favorites, creating a collage or mosaic with cloth. (Day 1 was June 24, 2008 and Day 2 was July 5, but you can just search here for "Fabric flowers and Vase".) No sewing is required, just iron-on adhesive backing. I worked on this project once in class, and then did some more at home, but I ran out of fabric, ran out of adhesive backing, and ran out of steam. Since then, I bought more fabric and more special adhesive paper, but somehow never got around to it. Last week I was cleaning up my home studio and found the project and supplies in a bag. I decided it would make a nice project for January, when working over a hot iron is nice and cozy. Today I added the purple pieces toward the bottom of the image. Six Hearts, a photo by randubnick on Flickr. 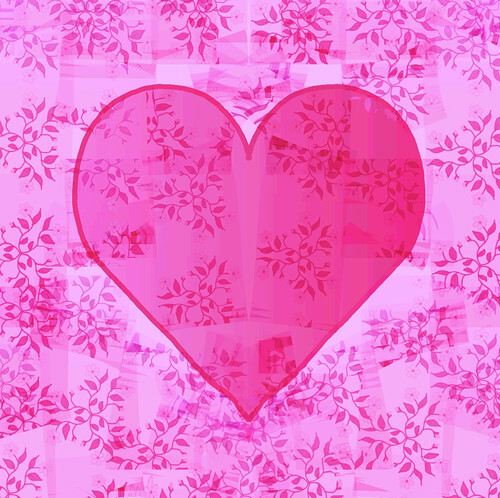 Last night I posted an image that I made by using Painter's "mirror mode" to draw a heart, and finished the image with a floral pattern (with the pattern pen) and some posterizing. 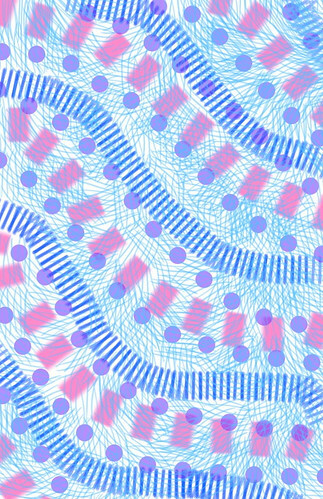 This is last night's image made into a second pattern. I think I will use this on Zazzle.com because Valentine's Day is coming up. Heart with Pattern, a photo by randubnick on Flickr. Tonight I decided to use mirror mode in Painter, so that whatever you draw on one side of the digital canvas is replicated on the other side (like kaleidoscope mode but with just two sections). 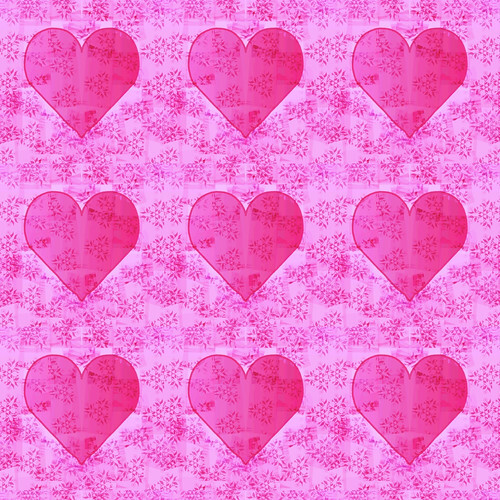 I thought it might be a big help to draw hearts. I decided to try it because it will be February before you know it, and I have been thinking about making some Valentines for Zazzle. It took me lots of attempts to get a heart shape that I liked. 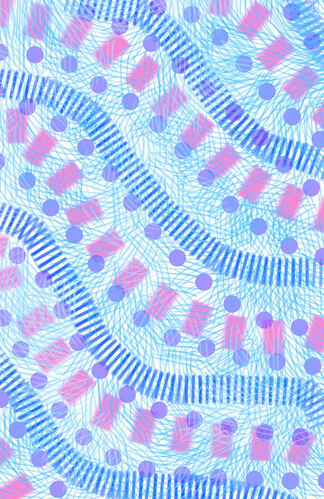 Then I used Painter's pattern pen, and selected one of the patterns that I made (in kaleidoscope mode). After I had the strokes where I wanted them, I turned off "mirror mode" and did some posterizing and color overlays till I had the effect that I wanted. Then I cropped the image to get this composition. I also "captured" this image as a pattern, and will plan to post it here tomorrow. 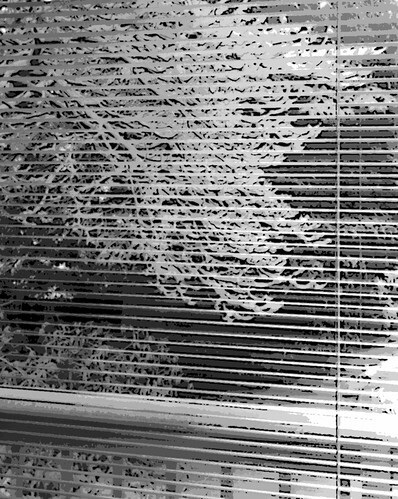 Snow Scene Through Window Blinds (Digital Woodcut in Black and White), a photo by randubnick on Flickr. Two days ago, I posted my photo of a snow-covered dogwood tree seen through window blinds. I took the original photo on December 30, the day we (finally) had a respectable snow storm here in Beverly, MA. Yesterday I published a posterized version of the photo, created in Painter 12. Last night I also created a version with Painter's woodcut effect, which emphasized the tracery in the tree branches. The color was similar to the posterized version. I decided to transform the image into black and white, which seems to work well for this image. Snow Scene Through Window Blinds (Posterized), a photo by randubnick on Flickr. Tonight I used Painter 12 to create this posterized version of the photo I posted yesterday: a snow scene through venetian blinds. (I took the original photo on December 30, 2012, the date of the only real snow that we have had so far here in Beverly, MA.) Tonight I also tried a woodcut effect, and I plan to post that here tomorrow. Snow Scene Through Window Blinds, a photo by randubnick on Flickr. Here's another photo that I took on December 30, the day of our (so far) only real snow here north of Boston. The snow on the dogwood looked beautiful, and I liked the contrast with the window blinds, so I took a picture. Tonight I used iPhoto to crop this image out of the original photo. 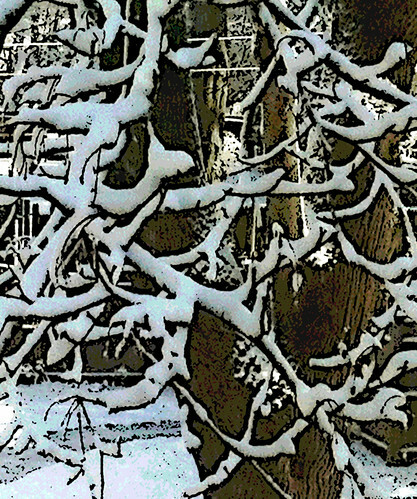 Snow and Tree Branches (Digital Woodcut), a photo by randubnick on Flickr. 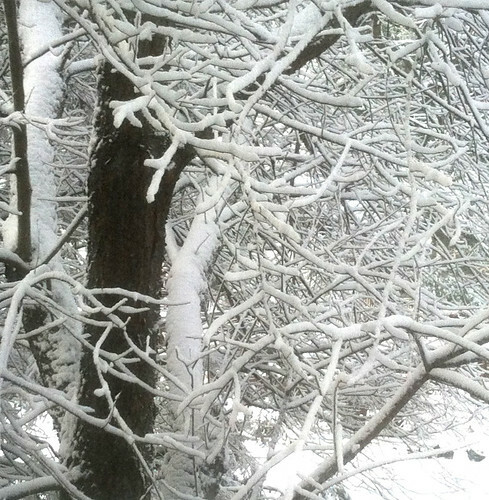 Here's one more version of "Snow and Tree Branches," the photo I posted two days ago. Last night I used Painter 12 to add a woodcut effect. It took some fiddling with the controls to get the black outline to land where I wanted it to go. 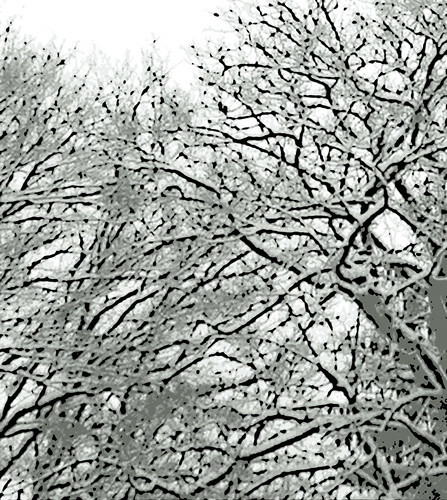 Snow and Tree Branches (Posterized), a photo by randubnick on Flickr. Tonight I used Painter to create this posterized version of the photo that I posted here last night. Because the image of snow and tree branches was the result of a pretty aggressive crop, the focus was soft. That plus the diffused light made it a good candidate for posterizing. I tried different levels of posterizing effect to get a result that I liked. I also created a version with a woodcut effect, and I plan to post that here tomorrow. Snow and Tree Branches, a photo by randubnick on Flickr. Tonight I cropped this image from another photo that I took last Sunday, December 30. This was the first "real" snow of the year. I noticed this view when I looked out a window on the second floor. 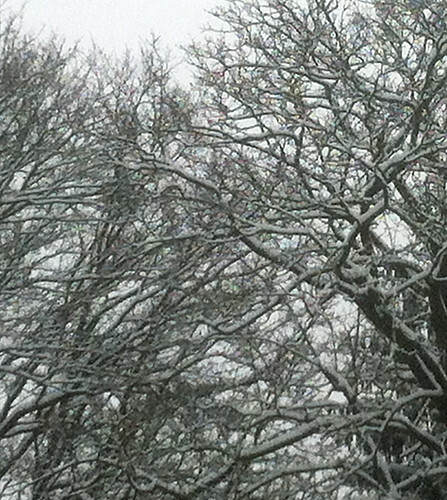 I took a quick picture because snow doesn't stay on branches very long. It either melts or blows away. You can see the sun was starting to come out, although it was too cold to melt the snow. The focus is a little soft here due to the cropping. Tomorrow I may try posterizing the image to see what that does. First Look First Snow, a photo by randubnick on Flickr. Here north of Boston, we haven't had much snow this year, just a dusting or two. But earlier in the week (December 30), we finally had some 3 to 5 inches. Although I am often inconvenienced by snow, I do love the way it looks, so I was excited when I looked out the window to see the tracery in this tree. I took some photos with my iPhone. I wanted to hurry before the snow was blown off the branches by wind. This was one of the best photos of the set. Tonight I used iPhoto to crop it to get this composition. 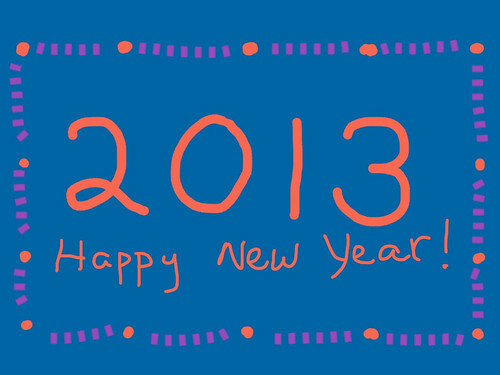 Happy New Year (2013), a photo by randubnick on Flickr.